Celebrating our eighth year, the History Maker Gala is an annual celebration of Central Minnesota and Stearns County history. A scrumptious dinner followed by an excellent story highlight the event which raises annual funds for the Stearns History Museum. This year, the Gala kicks off a yearlong celebration of the accomplishments of women in sports. 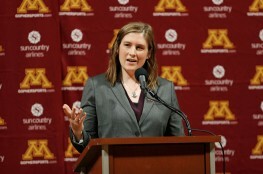 Lindsay Whalen, the current coach and a former player of the University of Minnesota women's basketball team, headlines the event. A pop-up photo exhibit available for loan and an online history of famous Stearns County women athletes will be unveiled at the Gala. For sponsorship information and a chance to meet Coach Whalen at a special reception before the event, contact Carie or Gena at 320.253-8424. Call 320.253-8424 or stop in at the Stearns History Museum.